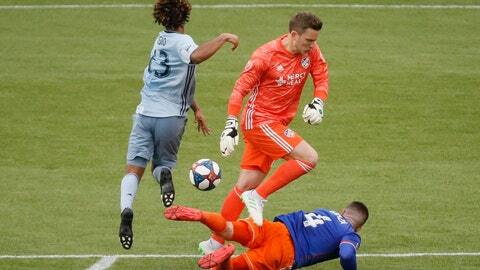 CINCINNATI (AP) — Gianluca Busio scored for the second consecutive game to help Sporting Kansas City to a 1-1 tie with FC Cincinnati on Sunday. A 16-year-old homegrown, Busio made his third MLS start and has three goals in 367 career minutes. Kelyn Rowe played an arcing pass from near midfield to a streaking Busio near the top of the box where defender Greg Garza and goalkeeper Spencer Richey, who came off his line, got tangled up allowing Busio to roll in an empty-netter that made it 1-1 in the 62nd minute. Darren Mattocks, selected by FC Cincinnati (2-2-2) in the 2019 Expansion Draft after scoring 10 goals for D.C. United last season, converted from the spot in the 19th after Kansas City’s Roland Lamah drew a penalty conceded by Andreu Fontas. Adrian Zendejas, a 23-year old making his MLS debut in place of Tim Melia (rest), had three saves — including a leaping stop of a free kick by Leonardo Bertone in stoppage time, for Sporting (2-1-2).